Benefits includes access to Stocks, Daily Updates, Technical & Fundamental Scans alongwith My StockEdge Account. Benefits include advanced Technical & Fundamental Scans, Combination Scans and an adfree experience across all platforms. Unique Virtual Club providing access to StockEdge Premium Features, Webinars and continuous learning among Club Members. Get end-to-end information about all the NSE and BSE stocks in India, covering market movements, updates, financials, technicals and derivatives. You can also navigate stocks by Sectors or their constituent Industries. We present you the information graphically through simple and interactive charts and bars, thus saving time and energy and speeding up your analytics time. Everyone has their own preference, so you too can mark Stocks, Scans and Investors as your favorite and track them effortlessly under 'My StockEdge'. Track and Analyse the Market trends, patterns and behaviour, FII and DII activities instantly. Get tools to generate fresh investing and trading ideas. Beat the complexities of stock market. Listen to short videos on topics that matter, whenever you can spare some time. Keep learning, Keep growing! It is our constant endeavour to add new features to the App based on users need and feedback. So Keep sharing your feedback and Keep Updating the App! As an Investor, this decision making tool helps in analysing your favourite stocks and also helps you in identifying new stock ideas based on relevant criteria. This tool provides focussed information most suitable for pre-market and post-market data analytics. Its unique scan feature is optimum for intraday and swing traders and also to derivatives traders. This App is the one-stop solution for your immediate fundamental and technical research requirements. If you like crisp and precise information, StockEdge is just for you and your followers. "Lovely fantastic awesome!. Thank you so much for providing great tool for taking investment and trading idea. I have no words for you. What you did for this app. Every day I track your app and comprehensive and many valuable news making me slowly and steady a mature trader and investor"
"This app is surely the best finance app. Having tested many apps like moneycontrol, ET, investing. This is the only app with comprehensive analysis data with futures and options positions. Serious traders should really consider this." "Must have market app with everyone I am in to market from last 10+ years, I have never seen app. Like this. Fabulous app and one stop shop having scans / bulk deals data / Mkt activities. Now it's added more learning superb." "Best App having features not available any other I installed this app after having tried multiple apps. This is just perfect. It has the feature of giving erts for buy or sell when the trigger price is reached. Also it tracks the stocks since it has been added." "Stock Trading Wiki Perfect and a must have app for a stock trader. The analytics and the ease of operation is tooooo superb...Thanks team for such a useful and informative app."  "From my experience I recommend to use stockEdge StockEdge | An Indian Stock Market Analytics it's is one of the best app for stocks with analytical features." "Download the StockEdge App. Its one of the best apps i have used !! Its heaven for All investor/trader .  #stockedge"
"	Best app among rest Best above all trading app...... No words..... just keep up the good work guys....."
Have some questions or suggestions for us, give it here!